yes the ink is Vegan. 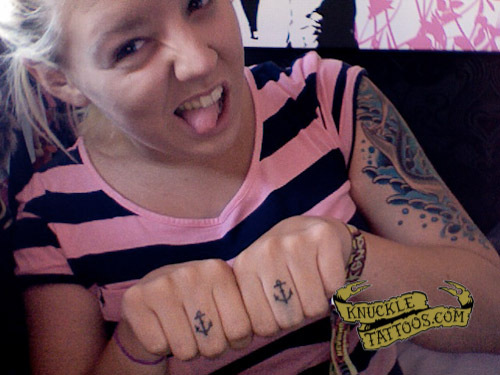 I’m Charlotte from London, England, and i’d love to tell you the story with my anchor knuckle tattoos. Throughout my life i’ve had struggles with my emotions and behaviour, being diagnosed with bi-polar when i was just 12 years old. The medications and antidepressants sent me through a whirlwind of problems throughout my teenage years, and it really made me feel as being positioned on this earth was just a waste of not only my own time, but also my family and friends. I had attempted suicide when I was 14, yet I was luckily found before the angels took me. At the time I was on a weekend break away in the coastal town of Newquay when I tried to take my own life, and my first image of waking up was in the hospital overlooking the sea. I had always a passion for marine biology, and i felt this moment in my life was some sort of calling, watching the waves crashing on the Newquay beach and the boats out in the horizon. This moment in my life had inspired my anchors – which are weighing me down to earth. No way will I be reaching the skies anytime soon. This is my friend Tony (on the left) and myself. 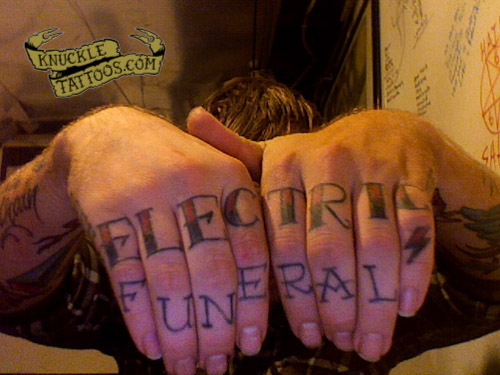 We both had this tattoo when we met. 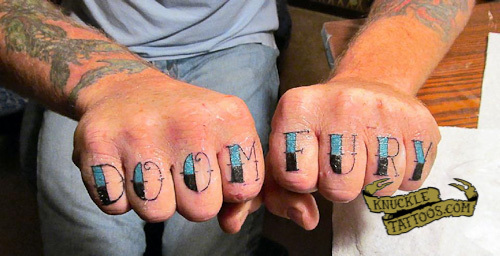 Never had either of us met another person with a knuckle tattoo in this fashion, but to have the same words? We knew immediately that we would be close friends, and have remained so since the day we met. The odd thing? We are both in recovery, and the tattoo symbolized the same thing for both of us. To never regret where we came from, but to always look forward to who we can become. Mine as of last night….. 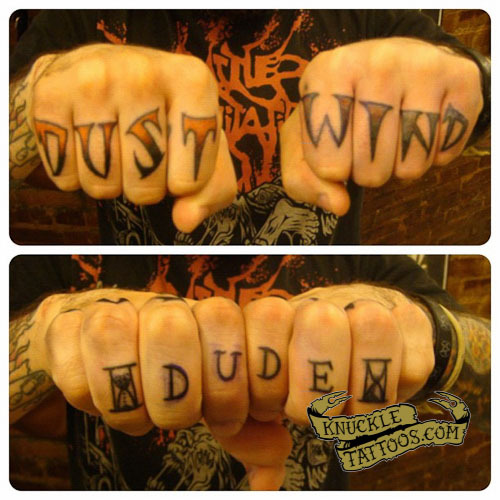 I don’t turn down a fist fight…..
Hello, my name is Chad. 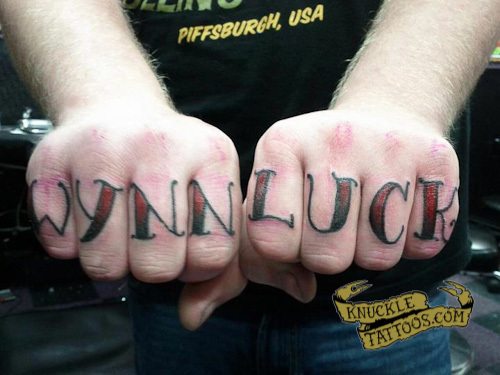 I am 24 from pittsburgh pa. My knuckles say WYNN LUCK. I know Carry Hart has the same concept. I have always been very close to my grandparents. Every time something bad or unfortunate happens in our family we always say, well thats the Wynn luck. 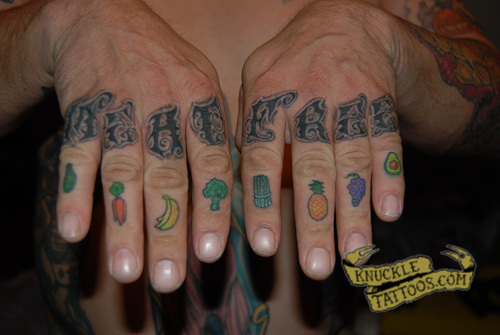 I’ve wanted my knuckles done for years, and one night while visiting my grandparents we were talking about their string of bad luck and the Wynn luck was mentioned. At that moment I decided I was gunna get Wynn luck tattooed on my knuckles. I stepped outside and called my artist who said he could fit me in that night. I asked my grandparents if they were going to be up for a while and they told me, yeah why? I told them i was going to get Wynn luck tattooed on my knuckles. They both laughed thinking I was joking. Sure enough three hours later I returned with it done. This tattoo means the most to me out of all of mine because it will always remind me of my grandparents. Ive been through alot of stuff through out my life with them and it will always bring back all the great memories. I consider my grandfather my best friend. He was just the best man in my wedding this past october. I moved 40 miles away from them to be with my wife and it’s nice to see the tattoo everyday and know they will always be with me. 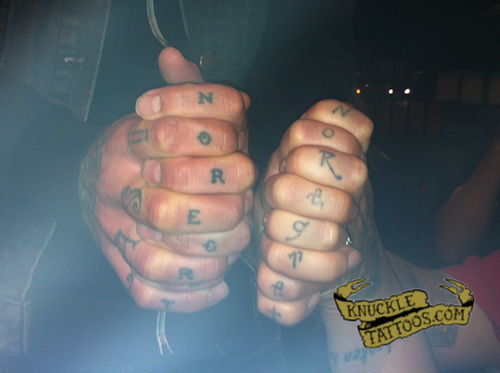 Thanks for reading my story behind my knuckles.